Midweek meals tend to be the recipes I struggle with most. Trying to find the right balance of wholesome, quick and above all else tasty can be a little hard when you are away from work all day. I tend to batch cook at the weekends for when we are working on long shoots but sometimes life isn’t so planned out. I try to keep enough fresh ingredients in the fridge during the week so when I get home I can just throw something together that doesn’t take a huge amount of effort but I’m left feeling satisfied. 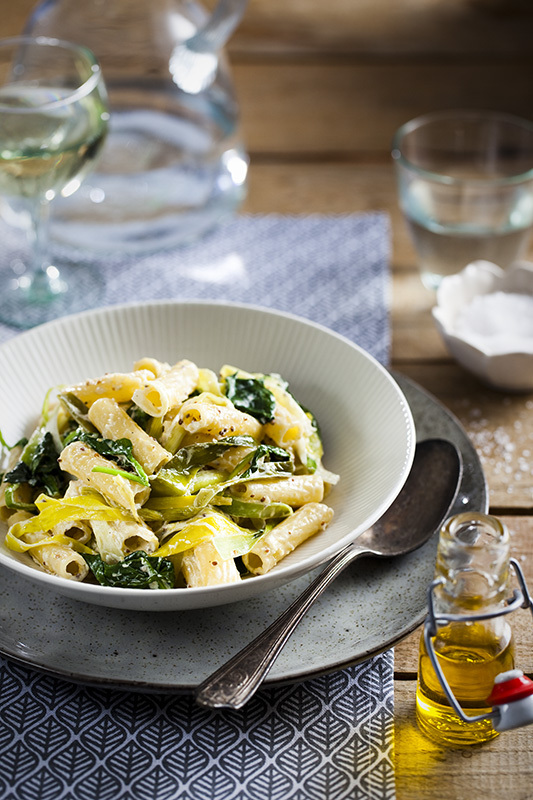 Pasta is always the best ingredient to centre around a quick meal so we tend to fall back on it regularly especially for meatless dishes such as this one. I first featured this recipe in the Dutch magazine Foodies but I thought it worth sharing for anyone trying to use up some leftover leeks or crème fraîche. I’d love to hear from you if you give it a try. Let me know in the comments or I can usually be found hanging around Instagram. Melt the butter with the oil in a large pan, add in the leeks and splash in a little hot water. Cover and cook over a low heat, stirring occasionally, for about 10 minutes until no longer squeaky. While the leeks are cooking, cook the pasta in some boiling water that has been well salted. spinach, a big handful at a time, until it wilts, splashing in a little more water if needed. Sprinkle over some parmesan and a little olive oil and serve straight away.